Just Another Day...: New Tables! 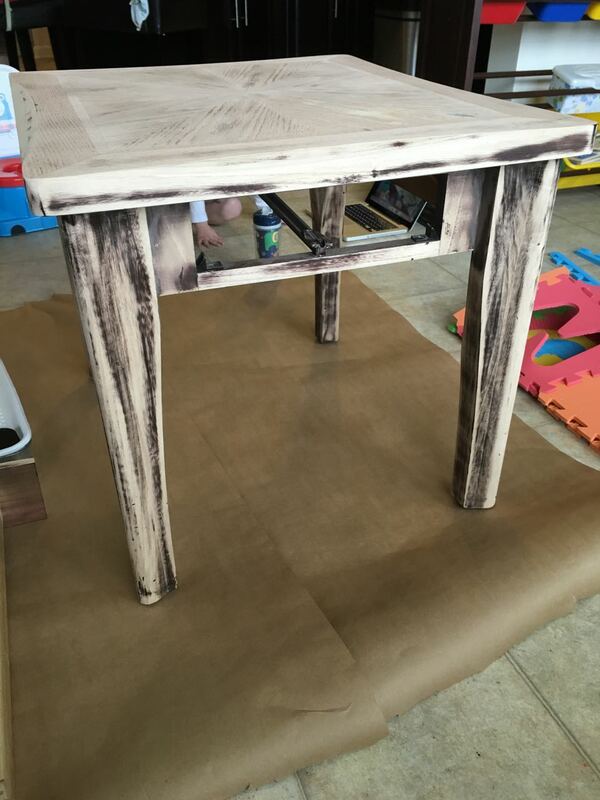 I've been DIY'ing a bit lately and am super stoked to share a recent win! Our living room coffee table and end tables have seen better days. After nine years, three kids, and extensive abuse, they were just sad and embarrassing. 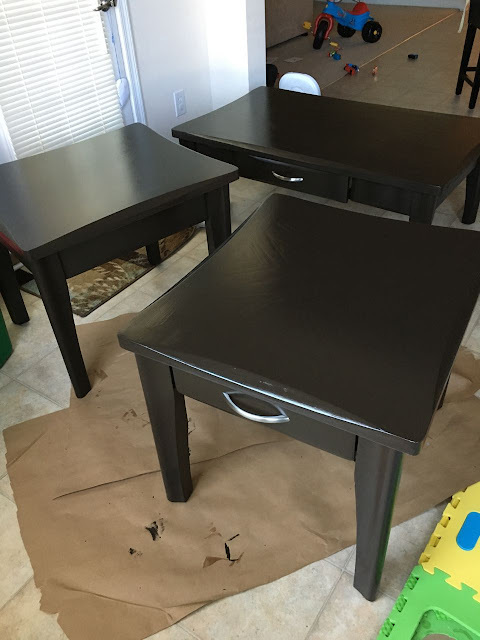 Hubs and I had discussed refinishing these tables for YEARS but never found the time to do it. I decided that time had arrived last week. For starters, this is what I had to work with. The worst of the three tables. 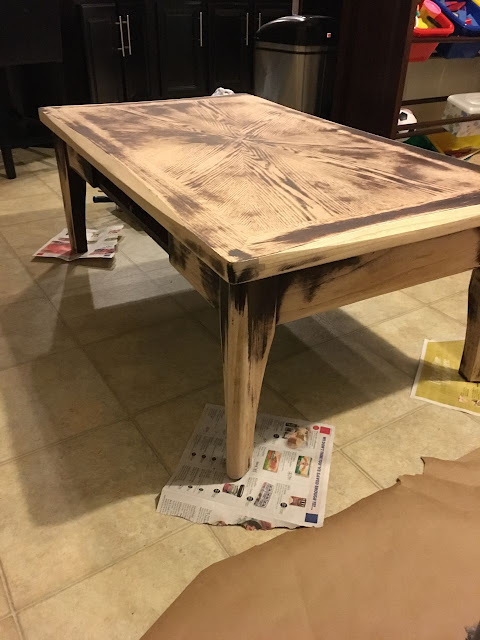 The finish was chipping and it looked just awful. See? 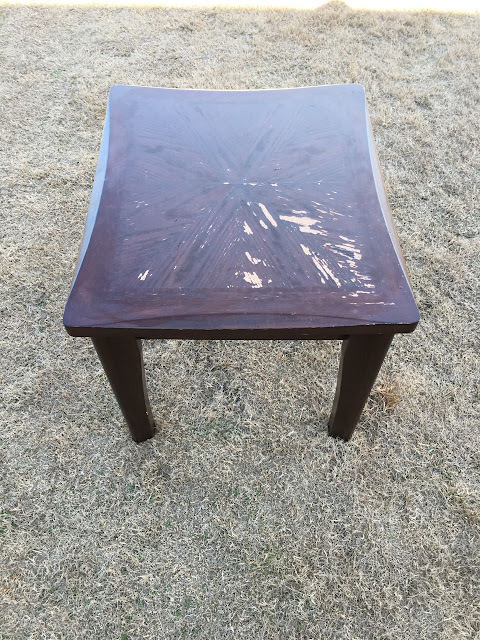 My first step was to sand the finish off. I used a power sander with 60 grit sandpaper. Surprisingly, there was a LOT of finish to get through in order to get to the bare wood. I think I may have sanded through about 3 inches of furniture polish, too. Love the cool pattern in the wood on the table top! 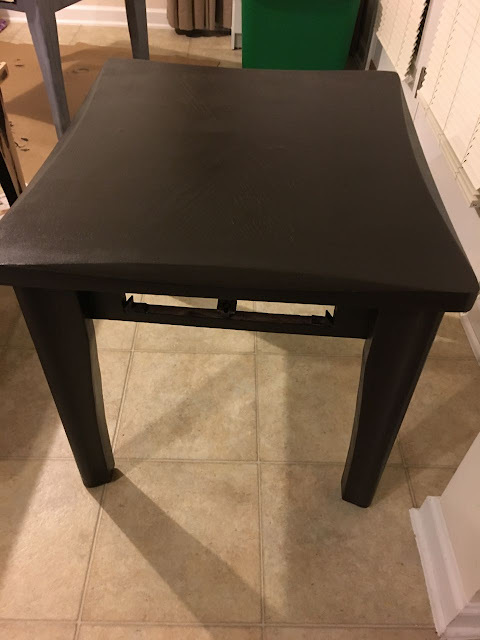 After thoroughly sanding the first end table, I wiped it down with a wet cloth (skipped the mineral spirits method and tack cloth method) and put on the first coat of paint. 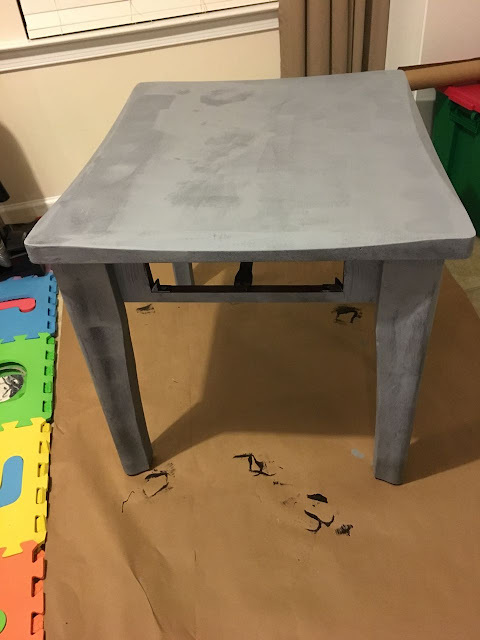 We decided to skip the labor-intensive sanding with the other end table and instead used a primer that we had tinted gray. It was much quicker and easier to do the primer instead of the sanding, but we were most interested in how the tables looked when they were finished. The coffee table was a bigger undertaking. 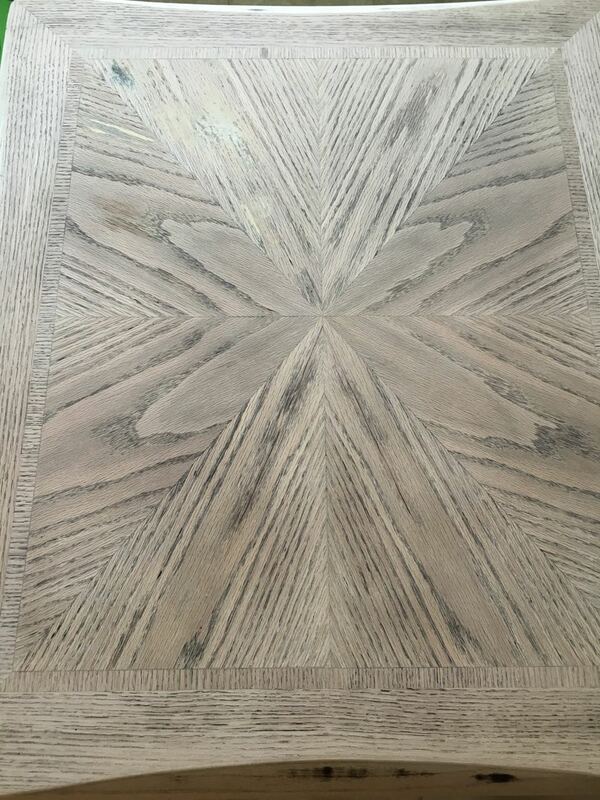 We decided to sand it just to ensure the best possible finish as we didn't want to risk the primer plan not panning out. 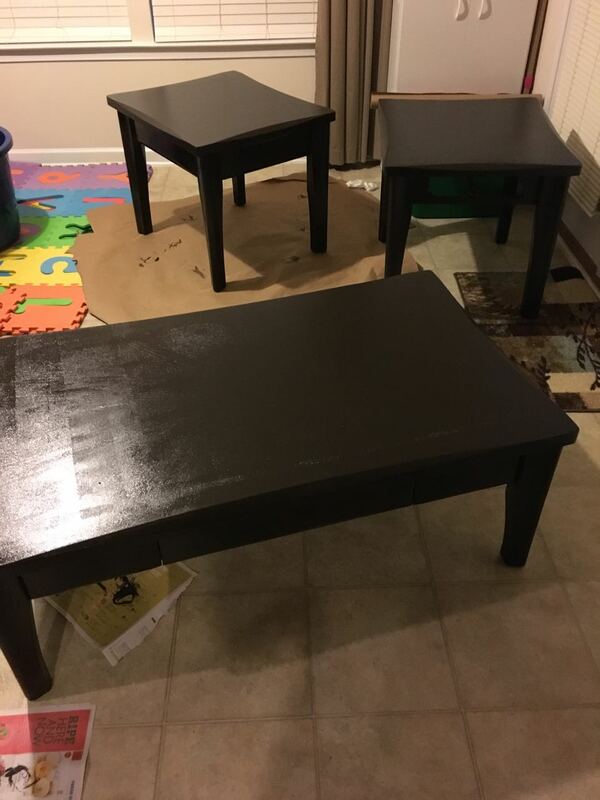 Here they are after a coat or two of paint. Already SO in love with the transformation! 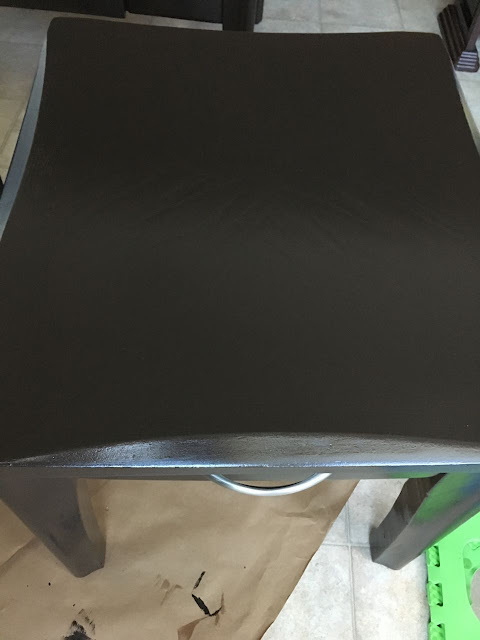 A few coats of poly later, and our shiny new tables are, well, shiny and new! I'm so happy with how this project turned out. 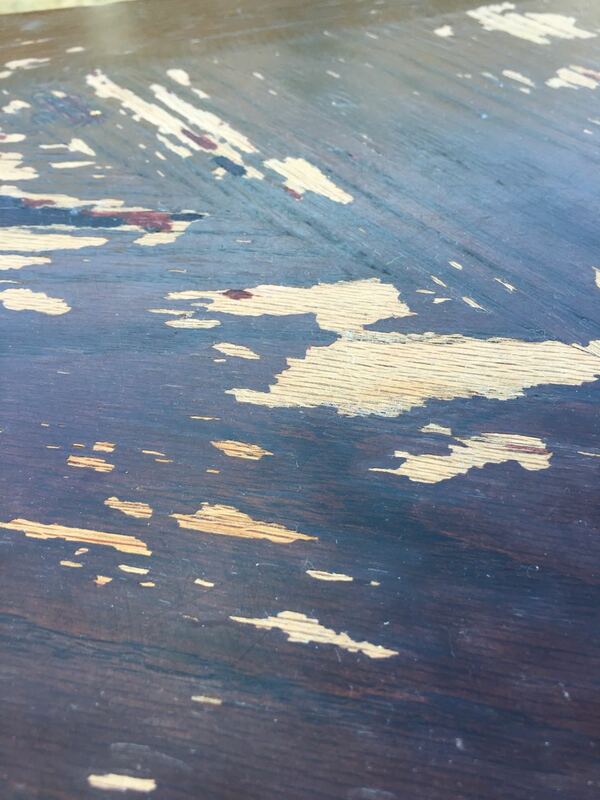 The best part was that we can easily refinish indoors with this process. Neither the primer, paint, nor poly had a super strong odor, and it seemed the primer worked just as well (if not better?) than the messy sanding we had to do outside. This is all great news because I have a ginormous dresser next on my list to refinish! Here's a close-up of the finish. Such a huge improvement, amiright? And a little side-by-side of the Before and After! So happy with our "new" tables!! !